I remember mules, remember them well; how they smell when they sweat, how they get stubborn and won’t “whoa” when you get to the end of a row because they want to go to the barn, how they don’t “gee” or “haw” in time and pull your plow into the tender corn, causing anger and cussing. When my father was at it, he used every cuss word in his vocabulary, and he had a good one. Even Grandpa Etris, a Baptist Deacon, used mild words like “hell” and “damn” when he walked behind a mule. I thought that was part and parcel of plowing. When my time came to take a turn with ol’ Tony, I used a few of dad’s choice words and got a whupping right there in the field between the rows of bean sprouts. Sometimes when I wasn’t needed, I would watch him. He would be bare to the waist, wearing faded cut-off khakis and lace-up work boots. As he retreated down a long row in the prime of his manhood, tanned and golden in the sun, with his broad back and muscular arms controlling the single-tree plow, I thought he looked like Apollo driving his chariot across the sky. I didn’t know then that the Gods die. That we would someday find Apollo lying on his back in a furrow beside his steed with the reins still in his hands, never to rise again. II took the song to Nashville and Billy Edd Wheeler, who suggested I make some changes. Having heard his own compositions, I knew it would be a better song if I took his advice. With some input from Alex Harvey, I changed Reuben to be an old black man, misunderstood and persecuted. Billy Edd sent the tune to Los Angeles to Eddie Reeves, who told Kenny Rogers about it while they were golfing, went back to the office, played it for Kenny and lightning struck. 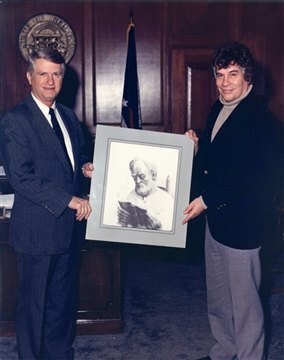 Barry presents “Portrait of Reuben James” to Zell Miller. In my song you’ll live again. All the folks around Madison County cussed your name. The gossip of Madison County died with child. One dark cloudy day they brought you from the field.